Dance anthropologist, story teller, singer, dancer and choreographer of North African Maghreb dance. Biography, performances, articles on Algerian dance and traditions, workshops, and North African music including a live track. Mixes modern and jazz dance. Sultry Spanish influenced dance is some of their most distinctive work. Dance company that specializes in dance styles from Eqypt, Morocco, and Tunisia, founded and lead by Khalidah Kali in Chicago, Illinois. Includes class schedule and contact information. Bringing the fine art of dance to the Ozark Mountains of North Central Arkansas. Swing, ballroom and latin dance classes in North Eastern Pennsylvania. Offering dance classes, event organizing and dj services in the Triangle area of North Carolina. International performer of Middle East and North Africa dance. Information, music recordings and class schedule plus recommended reading list on academic and other aspects of dance. Public and private classes offered throughout the St. Louis area. Provides class information, history of the dance, performances, photo gallery, and FAQ. Classes offered at YMCAs in the city and county of St. Louis, Missouri. Includes class information, history and FAQ of the dance, photo gallery and links. International performer of Middle East and North Africa dance based in Los Angeles, California. Information, music recordings and class schedule plus recommended reading list on academic and other aspects of dance. 14 North Dakota Square and Round Dance Clubs North Dakota. North Dakota. Information and links to square and round dances clubs in North Dakota. Dancer Paige Whitley-Bauguess site. Contains information about classes in North Carolina, Paiges dance activities, the annual East Coast Baroque Dance Workshop, Craven Historical Dancers, a pair of videos, and arrangements of tunes to extant dances. The World Tribe Dance Company- a troupe which performs dances of the Middle East and North Africa. Located in Hampton Roads, VA.
Information about Foothills Old-time Dance in Lenoir, North Carolina, caller Roberta Kogut, fiddler Bob Kogut, The Footnotes, fiddle-making. Piedmont, North Carolina. Old Time Square Dance preserves and promotes old time and bluegrass music and Appalachian style square dancing. Waltz, foxtrot, Tango, jive and salsa lessons in north London. Annual weekend tribal dance, music and culture camp in North Carolina. DNE School of Dance: Ballroom instruction in North Chelmsford/Boston area. Illinois - instruction in Ballet, Jazz, Tap, Musical Theatre, Funk, Swing and Irish Dance. North Carolina School of the Arts includes the Contemporary/Modern Dance performance group. Dallas based group, dedicated mainly to contradancing. With calendar of events and pictures. Club based in North London, Pinner, Harrow, Stanmore, Middlesex area, for beginners and improvers. If the business hours of Amel Tafsout in may vary on holidays like Valentine’s Day, Washington’s Birthday, St. Patrick’s Day, Easter, Easter eve and Mother’s day. We display standard opening hours and price ranges in our profile site. 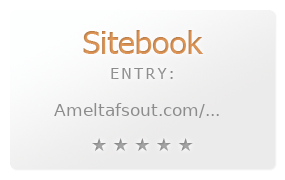 We recommend to check out ameltafsout.com/ for further information. You can also search for Alternatives for ameltafsout.com/ on our Review Site Sitebook.org All trademarks are the property of their respective owners. If we should delete this entry, please send us a short E-Mail.